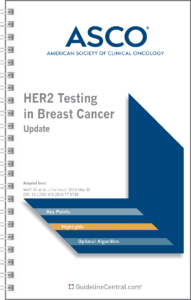 The Hormone Receptor-Positive Breast Cancer Pocket Guide is based on the latest guidelines of the American Society of Clinical Oncology and was developed with their collaboration. 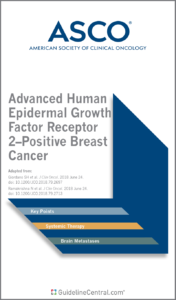 It contains graded recommendations for the adjuvant endocrine treatment of HER2-positive breast cancer including recommended medications and prognostic factors. Women with node-positive breast cancer should receive extended therapy including an aromatase inhibitor (AI) for up to a total of 10 years of adjuvant endocrine treatment. Many women with node-negative breast cancer should consider extended therapy for up to a total of 10 years of adjuvant endocrine treatment based on considerations of recurrence risk using established prognostic factors. The benefits in absolute risk of reduction were modest, and, for lower risk node-negative or limited node positive cancers, an individualized approach to treatment duration based on considerations of risk reduction and tolerability was appropriate. A substantial portion of the benefit for extended adjuvant AI therapy was derived from prevention of second breast cancers. Many women with node-negative breast cancer are potential candidates for and may be offered extended AI therapy for up to a total of 10 years of adjuvant endocrine treatment based on considerations of recurrence risk using established prognostic factors. However, as the recurrence risk is lower, the benefits are likely narrower for such patients. Women with low-risk node-negative tumors should not routinely be offered extended therapy. Women with node-positive breast cancer should be offered extended AI therapy for up to a total of 10 years of adjuvant endocrine treatment. Women receiving extended adjuvant endocrine therapy should receive no more than 10 years of total treatment. As prevention of secondary or contralateral breast cancers is a major benefit of extended AI therapy, the risk of second breast cancers (or not) based on prior therapy should inform the decision to pursue extended treatment. Extended therapy carries ongoing risks and side effects, which should be weighed against the potential absolute benefits of longer treatment in a shared decision-making process between the clinical team and the patient. Qualifying Statement: To date, none of the studies has shown improvement in overall survival with longer duration AI therapy. As such, the recommendations on extended adjuvant AI therapy are based on benefits that include prevention of distant recurrence and prevention of second breast cancers. The Panel recommends that higher risk patients should receive ovarian suppression in addition to adjuvant endocrine therapy while lower risk patients should not. The Panel notes that two prospective studies did not show overall clinical benefit for the addition of ovarian suppression to tamoxifen in premenopausal, ER-positive breast cancer. However, in a large subset of women with higher risk cancers, nearly all of whom received chemotherapy but remained premenopausal, ovarian suppression added to tamoxifen reduced the risk of breast cancer recurrence. Because of the design of the clinical trials, there are few definitive criteria by which to define risk. Women with Stage II or Stage III breast cancers who would ordinarily be advised to receive adjuvant chemotherapy should receive ovarian suppression in addition to endocrine therapy. Women with Stage I or II breast cancers at higher risk of recurrence, who might consider chemotherapy, may also be offered ovarian suppression in addition to endocrine therapy. Women with Stage I breast cancers not warranting chemotherapy should receive endocrine therapy but not receive ovarian suppression. Women with node-negative cancers 1 centimeter or less (T1a, T1b) should receive endocrine therapy but not receive ovarian suppression. To date there is no adequate evidence for assessing the benefit of adjuvant ovarian suppression in women at sufficient risk to warrant chemotherapy compared with 10 years of tamoxifen. There is no current role for ovarian suppression as adjuvant therapy in ER-negative breast cancers. There are substantial side effects to ovarian suppression. Clinicians and patients should consider the tradeoffs of side effects when choosing ovarian suppression. The long term effects of ovarian suppression on breast cancer risk and survival are not yet established. Ovarian suppression may be administered with either tamoxifen or an aromatase inhibitor. Tamoxifen and AI therapy differ in their side effect profiles, which may affect patient preferences. Clinicians should be alert to the possibility of incomplete ovarian suppression with GnRH agonist therapy and evaluate patients in whom there is concern for residual ovarian function.